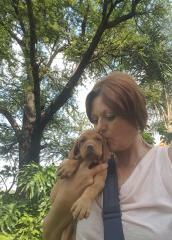 Our Hungarian Vizsla Puppies are registered at Kusa, micro chipped, inoculated and dewormed. Vizslas are lively, very intelligent, obedient, very affectionate and gentle-mannered. Vizsla dogs are highly trainable. Due to their natural friendliness and as a favorite of children, Vizslas make terrific family pets and adapt well to other household pets. The Vizslas are medium-sized, rusty gold color and have short, smooth coat. Hungarian Vizslas are also bred for hunting, pointing and retrieving. We are in Pretoria. Delivery can be arranged (by flight) on additional costs. More photos can be sent on request. Puppies will be ready to go when they are 8 weeks old. The kennel name, "Dewanze" is registered with KUSA. The buyer gets a KUSA registration certificate, with breeding restriction.